Energy is always in the news, and there is lots of information about big scale stuff: wind, solar, natural gas, etc. This conversation looks at our energy challenges on a more personal level. No one size fits all with our individual lives. Some folks can drive a Prius, but others need that F350. What are the small, accessible things we can do as individuals to achieve a better balance with the environment. The program opens with short presentations from four conversation starters, who will share their wisdom and enthusiasm on a variety of energy related subjects. This is followed by an open moderated conversation in which all audience members are welcome to contribute with questions, ideas, or their own stories. The goal is to illuminate the subject so that new ideas are shared and new connections are made, which can further advance progress for each of us (and our communities) lowering our carbon footprint. John Kondos is the founder of Solar Source, now a division of Melanson (a commercial roofing company), and president of the Monadnock Sustainability Network. Though now officially retired from the solar business, he remains a passionate advocate for exploring creative locally-based energy solutions. Bev Edwards is the chair for Temple’s Energy Committee, which was awarded the 2009 Climate Champion Award from Clean Air-Cool Planet for energy efficiency efforts on the local municipal level. They were later awarded a $320,000 RGGI grant from the PUC to conduct a deep energy efficiency retrofit for Temple’s FD, Municipal Bldg and library, as a model for other towns. It reduced the Municipal/FD complex’s heating fuel usage up to 75% and its carbon output up to 80%. In late 2011, Bev helped organize a regional grassroots organization, the Monadnock Energy Resources Initiative (MERI), which works with residents and social service centers reduce their fuel usage and increase awareness about the benefits of renewable energy sources. Cindy Sterling Clark has been a regional and national spokesperson promoting the 4R’s (reduce, reuse, recycle, refuse) within rural communities since 1992. Her experience includes networking with state, regional, and national affiliations on legislative issues, expanding regional composting programs, creating opportunities to collect universal and hazardous wastes, and increasing public awareness of waste disposal alternatives. Cindy is an Adjunct Professor in the Geography Department at Keene State College. She is also is the founder of Impact Earth, an environmental education and grant writing agency; and, owner of Sterling Studios, LLC, a Kripalu affiliated yoga studio. Shannon Bennett is a member of the Conant High School Environmental Club. 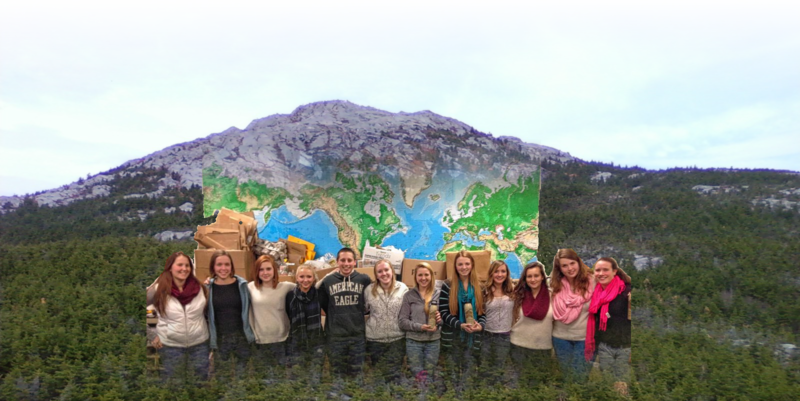 Just a few months ago, Conant High School in Jaffrey did not practice recycling. As of today, the school has filled a four-cubic-yard recycling container 11 times, which translates into tons of paper, cardboard, plastic, cans and other materials being shipped out to recycling plants, to be sorted out and reused. The Club presented a recycling policy proposal to the School Board last June, and the policy passed the first reading with no changes in content. This requires every school in the district to practice recycling in the classroom, common areas and school events. The policy also recommends cooperation between students, faculty and custodial staff to ensure most materials are recycled. Community Conversations is a series that explores many of the issues impacting our communities. A partnership between the Monadnock Center for History and Culture and the Monadnock Ledger-Transcript, each Conversation opens with short presentations from local experts on the chosen topic. Some issues are global in nature, but each conversation is designed to examine the topic from a local perspective. The program provides residents with the opportunity to learn more about key issues impacting their communities, to engage in a civil dialog with speakers and with each other, and to come away with a sense that there are things that individuals and communities can do to foster change and improvement. Community Conversations are held in Bass Hall at the Monadnock Center for History and Culture, 19 Grove St., in Peterborough. The program is free and open to all. Harlow’s Pub is the business sponsor the 2015 Community Conversation series.